Over 80 inventive and imaginative shapes and figures to create with finger strings. Finger string games are a wonderful opportunity for today's children to practise meaningful movement, explore space, interact with others, and exercise their creative spirits. They're also great fun! String games can be particularly useful with children who struggle at school, are dyslexic or who are learning concepts such as 'left and right', 'up and down'. The book contains games that will delight all children, from the very young to those with greater dexterity. 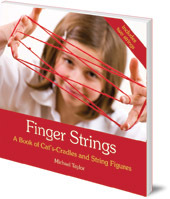 Michael Taylor has many years of experience in working with children and has shared his string figures at schools and camps throughout the world. This book contains over 80 inventive and imaginative string games and stories, all clearly illustrated with step-by-step colour diagrams. The book is particularly designed to require as little page-turning as possible in the middle of making a string shape! Includes two brightly coloured strings to get you started. Michael Taylor is a teacher at Philpots Manor School in the UK who promotes traditional childhood games of movement and agility for the classroom, playground and gym. As well as string figures he collects and teaches clapping games, finger-games, jump-rope activities, ball-bouncing and bean-bag games. He always carries a string with him, and has been known to share string patterns with strangers on tube trains and aeroplanes. He is the author of Pull the Other One and Now You See It.